The neighbours are away just now, and Margaret is dropping by to cat-sit. But it’s clearly not enough for the two bored and lonely moggies in question, so they’ve set up a sort of Black Ops operation in the front yard to watch for whenever we open the front door so they can demand attention. One of them is permanently on guard, alerted by the scrunch of gravel, and gives the cat-signal so that the other suddenly materialises as if beamed down from the starship Enterprise—on the wall, or on the front step, or even, one memorable time, apparently inside my trouser leg roughly halfway between the ankle and knee. Once when I thought the coast was clear I heard the urgent whisper: “Bravo-Niner-Zero: Smoky, are you reading? The goose is in the nest, repeat, the goose is in the nest, over”—and when I looked round, there Smoky was, lying on her back on the gravel, waving her legs invitingly in the air as though practicing feline synchronised swimming, and mewing like someone trying to tune in to Radio Teheran on an old dial-up radio. I can tell they’re desperate for attention because they let you pat them without stripping your fingers to the bone—usually they act more like piranha fish that’ve learned to negotiate a cat flap. All the same, there’s a look in their eyes that tells you this is just temporary—like a Christmas truce in the trenches—and that once the neighbours are back I’d better invest in some oven gloves if I plan to indulge in any more of this tummy-tickling nonsense. Meanwhile—while I still have the use of my fingers—I’m getting plenty of knitting in. 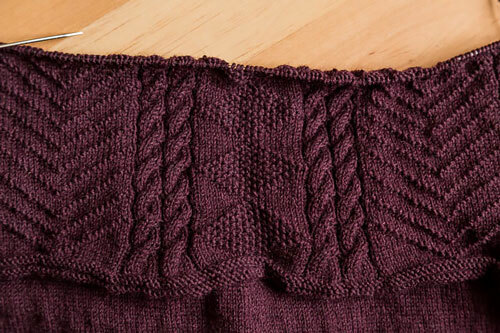 I’ve been putting in some serious hours on the gansey, and have just divided from front and back after completing half the gusset. You can see the pattern better now, a good, strong, classic design that works really well in what is, after all, a fairly dark colour. One interesting thing is that my row gauge for the pattern seems to be 11 rows to the inch, whereas on the body (plain knitting) it was 10. 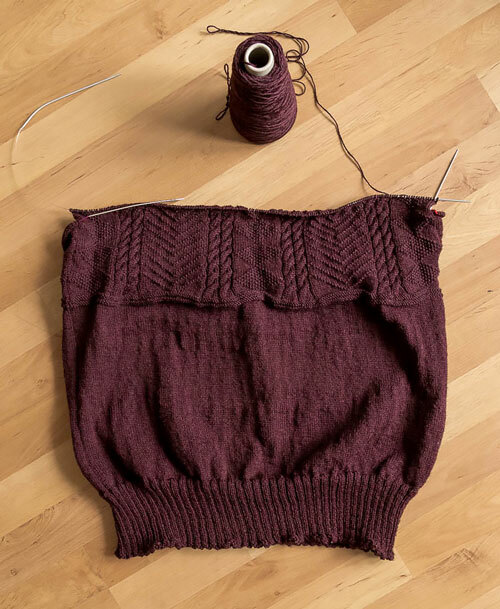 It can’t be that I am knitting more tightly—if anything, the reverse is true, as I’ve deliberately loosened up a touch to compensate for all those double cables, which inevitably draw in the knitting. Scientists are baffled, and I believe the Large Hadron Collider at CERN is currently working on the problem, but it means that my brilliant calculations of last week are now only fit only for wrapping chips in. Hi there Gordon. Here on the Wet Coast of BC in Canada, we’re in the middle of the driest year we’ve ever had. No snow last Winter so the local hills’ ski season was a bust. Lots of rain but that doesn’t fill the drinking water reservoir in the Summer. And we’ve had the warmest Spring since we hosted the Winter Olympics – we were out in shorts & tees in February & hauling snow by truck – they called it the Spring Olympics. We were eating local strawberries three weeks early!! We’ve had a heat wave going on for the last three weeks except for one day when it got cold & rained. That’s it. Nice change for us. I don’t call it the Wet Coast for nothing. Enjoy all that Catty attention. Dogs were born to be slaves but Cats have servants. 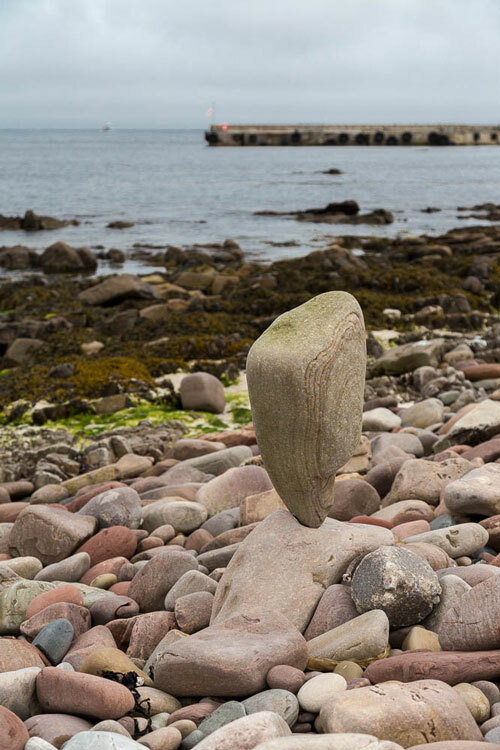 We’re in a funny weather pattern just now and have been for weeks – low pressure is sitting north of Scotland, bringing endless cloud and cool winds, while England basks in temperatures in the high teens or low twenties. So I know the Brits tend to moan about the weather a lot, but to be in a situation where 12 degrees and sunny is so rare as to be worth talking about is kinda disappointing! But I know it’s different in other parts. The cats sound like good fun. I think it might be what one could possibly call ” hedging one’s bets”, that means in catty terms should the usual hand that feeds not return, you and Margaret are the next chosen ones. I speak as the object of three rehomed cats, manipulation as a fine art! If I might say, what a super pattern and a really lovely colour, very effective. The tension thingy is definitely In the past. 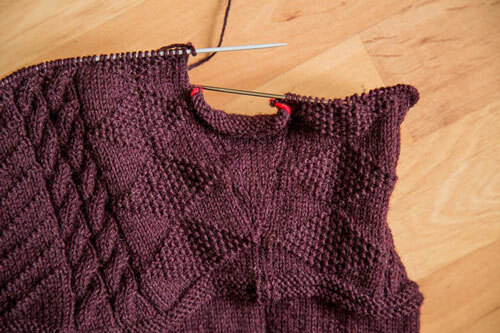 Now this is only speculation, but could it be the movement of the yarn in the knit purl area of the pattern that gives you that very, very slight increase in row count. Take care. 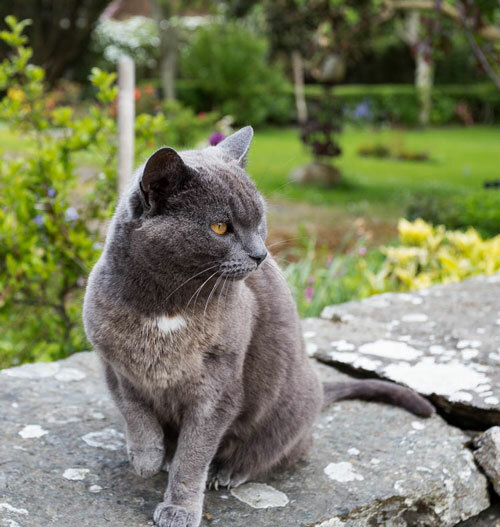 Hi Jane, I know I’m being played, and have the word “sucker” tattooed on my forehead in cat language, but what can you do? They’re cute, even while flaying the skin from your arm like a Victorian threshing mill. My cat has brought in a mouse this week, plus two birds. Presents. Fine pattern, lovely colour! Happy knitting! Hi Judit, thanks – you too. Any projects on the go, or are you just enjoying the summer? Gather the patches together alternately horizontal and vertical direction to make a whole blanket. You can use either a needle or an hook when putting the patches together. To make a blanket for an adult person you need 63 patches (7 x 9 patches). To make a blanket for a child you need 30 patches (5 x 6 patches). I am practising gansey motifs with the patches. Gordon, many thanks for the idea. Have a nice holiday Margaret!